Sartre of course should have known this, being of good Alsatian stock. And yet not once in his aforementioned existential treatise does he point out that the human condition improves immeasurably with the regular intake of Riesling. Thankfully, Sartre has been succeeded by thinkers like Grieco and Aussie counterparts Jason Hoy and Stuart Knox. Grieco founded Summer of Riesling in 2008 and the concept arrived down under in 2011 thanks to Hoy, of boutique wine distributor AWR, and Knox, the sommelier behind Sydney institution Fix St James. The idea, as explained in my article in the Guardian, is simple: to get people to drink more Riesling. Hence we’re being treated to two months of events across the nation, with a host of bars, restaurants and producers involved. The showpiece is a dedicated pop-up bar called Bottle and Beast, which opened its doors in Sydney in mid-January and features 125 Rieslings accompanied by Jared Ingersoll’s cuisine. Another endearing trait is its honesty. It speaks candidly of the place where it’s grown, which explains Thompson’s decision to name her entry-level wine 5452 after the Watervale postcode. She also produces two single-site Rieslings named after the Churinga (planted 1954) and Peglidis (1970) vineyards. “There are very few tricks you can hide behind. 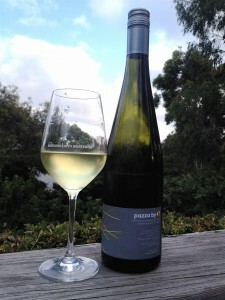 And Riesling doesn’t suffer fools,” says Thompson. So you’d think it unwise to go playing games. But despite her deep respect for the variety, Thompson’s Melva and Pazza wines prove she’s not in thrall to it. In both cases, fruit from the Peglidis vineyard in Watervale “gets thrown about a bit and treated pretty meanly”. The first vintage of Pazza was 2012, a kind of experiment to see how far she could push the indigenous yeast, barrel-fermented, lees-stirred style of her glorious off-dry Melva. The Pazza is oxidatively handled and fermented in a mix of stainless steel and ten-year-old French oak barriques, where it spends about three months before being bottled without filtration. The name means ‘crazy’ in Italian. That would’ve seemed apt when her first attempt turned bright orange, giving the distinct impression she’d buggered it up. She needn’t have worried though. It came good and the craze is set to continue. “I just find the imperfections sometimes create something so captivating,” says Thompson. No way could Sartre have summed it up better. Pale lemon in colour and a touch turbid, the nose is bright and pronounced, with lime blossom, tangerine, lemon sherbet, ruby grapefruit, bath talc and creamy yeast. Dry and medium bodied with a chalky minerality, it’s immensely alive and fresh on the palate, with all the lifted citrus evoked by the nose plus some white peach beneath. And then the texture: soft, creamy and somehow broad enough to carry several clear and delicious signals at once, while the fine natural acidity ensures no slackening of pace and focus. It finishes with savoury kaffir lime, grapefruit pith and a murmur of lemon soufflé. Mind-expanding stuff.